In a ceramic tile and stone showroom the two biggest challenges for customers are visualizing how the tile or combination of tiles will look installed in the home and determining which tiles are suitable for their intended application. Figuring out how to address these two challenges should be a priority for every showroom. Along with that, conveying the features, benefits and limitations of the products is the next challenge. And perhaps the most important piece of the showroom puzzle, is to train sales people so they are knowledgeable and competent showroom consultants (I wrote about this previously on the blog in, How Training and E-learning Can Improve ROI). Years ago, when I was an importer and distributor with several showrooms I coined the term Intelligent Merchandising to represent the approach we developed to help our customers make selections and our sales people more effective in assisting our customers during the selection process. The challenges we faced back then are the same challenges many of you face today. Then, ceramic tile and stone was relatively new to consumers. They had lots of questions and tended to be possessive of the showroom consultants assisting them. The consultants would sometimes get frustrated by customers who insisted on undivided attention since it became difficult to help new showroom visitors. As most retailers know, showrooms tend to run hot and cold - sometimes empty and other times loaded with customers - but you can only have so many sales consultants working at one time. We made a point to teach our consultants to manage busy conditions so customers were never ignored. We taught our consultants that anyone who stepped through our door represented a potential large sale because people don't tend to visit tile and stone showrooms unless they are in the market for the product. We spent considerable advertising dollars to bring those people into the showroom and we didn't want any of them to walk away. Training new sales consultants in a busy showroom is a challenge. Typically, we couldn't find experienced tile and stone salespeople so we trained them ourselves. Often, trainees had to look to experienced showroom consultants for help to answer customers questions. This took productive time away from the more knowledgeable employees, slowed downed customer service and subjected our valuable clients to frustrating delays. Implementing Intelligent Merchandising in all of our showrooms was my way of responding to the challenges I've described above. 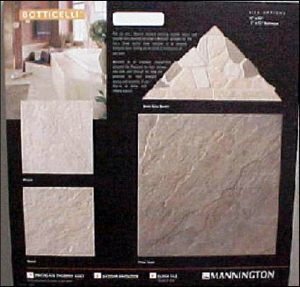 Intelligent Merchandising involved creating displays with at least one full-size tile sample and small sample chips of all the colors in the line. All the trim and accessories available for any given product were shown in the display. There was a list of recommended uses for each product as well as its features, benefits and limitations. We also displayed a photograph of an actual installation where the product was used to help customers visualize a finished room. If decorative tiles or accents or other finishes were available we may have also included them for the benefit of the customer to further visualize their options. Retail price lists and product availability were included. In addition to this, we created “vignettes” or mockup rooms in our showrooms featuring popular installation applications. We also had binders full of photographs indexed by application type to further help our clients visualize how to use ceramic tile, glass tile, and stone products in their home. Intelligent Merchandising solved several problems. It was a more complete display so clients could help themselves visualize the rooms or locations they were going to tile, and they could immediately get answers to all of their typical questions (kind of like today’s FAQs page on a website). It was a great sales aid for trainees too, because they could use the displays to quickly find answers to customers’ questions without interrupting another showroom consultant. Furthermore, the display helped teach the trainee more effectively by providing easy access and repeated reinforcing of the information, and it gave the trainee more credibility in the eyes of the customer because they could simply read the information from the display. Intelligent Merchandising was an intelligent solution for helping our showroom clients in a more effective and timely way. This avoided the scenario of frustrated customers walking out due to lack of attention. It helped the clients visualize and understand the kind of design options they had which often led to larger purchases. Clear, straight-forward information also led clients to purchase better quality products (and more profitable for us), which was essentially a result of them up-selling themselves! Today showrooms have the benefit of technology, which is a great asset, especially when it comes to helping the customer visualize a completed room. Inventories can be tracked faster and generally there is quicker access to key information. However, nothing can replicate the “touchy-feely” experience for customers who can handle the actual product, see the color and texture up close and help themselves when a showroom consultant isn't readily available. Visit the CTaSC website for more information. 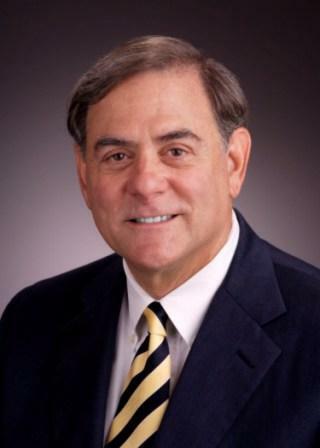 I believe that commoditization is the key issue facing the flooring industry now. I recently wrote about this threat on the Surfaces blog site and it seems my opinion has struck a chord. Commoditization is a process that transforms the market for unique, branded products into a market based on undifferentiated price competition. Most people agree that consumers will shop on price alone if they do not learn about performance and quality differences that justify a range of prices. That is happening all through our industry. If we let it continue it could lead to the destruction of our industry as we know it. Do you agree? FCI has just released its latest research paper: The Growing Opportunity in China, a look at China's economy, consumer market, floor covering demand and logistics channels. 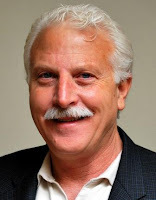 Researched and authored by Jim Gould, the paper is the first of its kind to offer an overview of China from the floor covering industry point of view. Here's a look at a few "fast facts" taken from the paper. Between 1.6 billion and 1.9 billion square meters of new floor space will be needed each year between now and 2025 to accommodate China's urban migration. This yearly increase is the size of the entire US market. China's floor covering market was 12.8 billion square meters in 2011. China is the second largest luxury market in the world. China is not a DIY market; consumers prefer Do-It-For-Me. 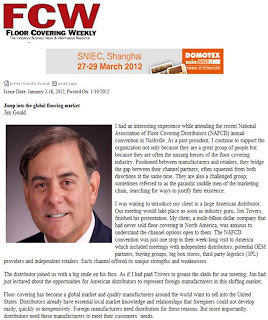 US exports of flooring to China increased by 36.8% in the first eight months of 2011. There are 700,000 logistics companies in China. 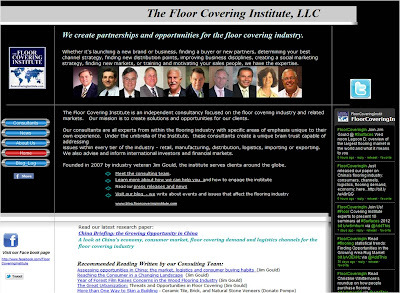 What does all this mean to the US floor covering industry? Is China an opportunity or a threat? Why do some large Western companies fail in China while others prosper? How does a company begin to to assess the opportunity in China? or go directly to The Growing Opportunity in China. Join us this year at Surfaces! Social media tools help flooring and stone businesses extend relationships with customers, however as easy as the tools are to set up, keeping them going can bring you to your knees. This workshop will teach you how to use these tools so the resources you put into them actually benefit your business. New hires represent tremendous risk. Learn what not to ask and what you have to know about prospective employees. There are proven methods that will tell you who this new person is and if you should or should not hire them. This seminar will save you lots of heartache and cash. Your future depends on knowing consumer and industry trends. This seminar will explore the future, and how consumer trends are going to change the way you do business. Drastic economic and social changes have influenced how we promote and market our products. What worked a few short years ago does not work now. Attend this session to understand these changes and learn how to adapt your marketing and promotion efforts to the new retail paradigm. Your success depends on it. 12:00 p.m. to 1 p.m. Many customers start the purchase process online. If they can't find you there, you don't exist for them. This session will teach you how to maximize the opportunities to be found online beyond store hours and physical location while also building credibility and trust with customers before they walk through your doors. We’ll discuss not just your website, but how social media can help you connect with customers. The session is designed to offer the manufacturer, distributor and retailer an overview of the opportunities and challenges facing the U.S. floor covering industry. Discussion will focus on sales by product, consumer and commercial markets, sales by channel, builder and replacement purchases, regional demographics and other trends. The goal is to have the information needed to develop a plan to face the challenges of 2012 and beyond. Review the physical, emotional and practical aspects of your showroom by exploring the best practices of the best retailers and service providers, finishing with the universal imperatives for a successful showroom. Women consumers make or influence over 80% of flooring and stone purchase decisions and, yet, many in the industry haven’t fully figured out how to market or sell effectively to them in-store or online. Women are demanding customers. Meet their needs, though, and see your overall business satisfaction and profitability improve. This session will review the latest marketplace trends, present a framework for marketing and selling to women customers and explore best practices from the flooring and stone industry. Most of the new technology in flooring materials exists in product backings and installation. In light of concerns about moisture issues, installation failures and socially responsible flooring products, no matter what position you occupy in the industry, you must know about the changes and paradigm shifts that are here now. All attendees will receive a copy of Jim's new Industry Briefing Paper: The Growing Opportunity in China - A look at China's economy, consumer market, floor covering demand and logistics channels. This session is for manufacturers and agents interested in expanding their business outside of North America. We will focus on opportunities, threats and methodology of trading in new and growing foreign markets.